My daughter bought me an Owl experience day for my 60th birthday. We have had a marvellous day. I would really recommend this experience. My daughter bought me an 'Owl experience day' for my 60th birthday. We have had a marvellous day - I flew barn owls, eagle owls and a great grey owl. Ian and Roy were both really patient and knowlegeable about the owls. It was wonderful being so close to the owls, watching them fly to me and being able to hold them. 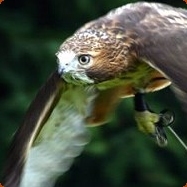 There are also a wide variety of owls and hawks to look at after you have done your 'flying'. I would really recommend this experience.